Before you read any further! Please be sure you clearly understand the difference between Acceleration Torque and Continuous Torque. Both have the same effect (a tendency to turn to one side), but happen in different situations and have different cause. Read more: Paramotor Torque Effect Explained. 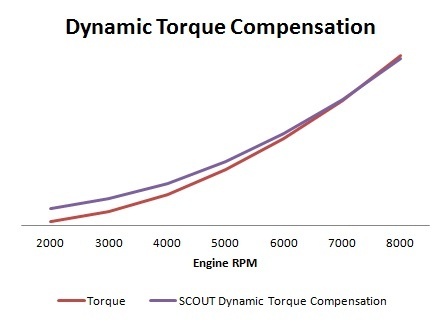 How does Dynamic Torque Compensation work? We use airfoil-shaped profiles on the cage. When air flows around them, these profiles act just like blades on a windmill. 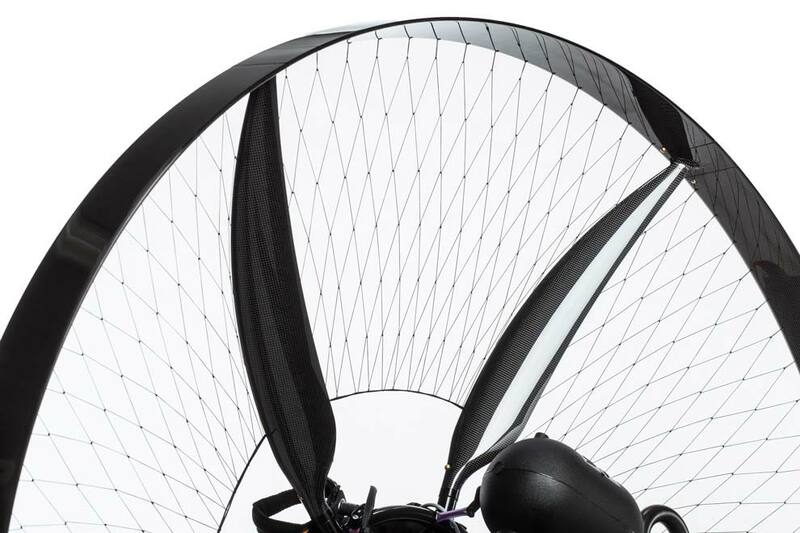 When torque turns the paramotor to the right, the Dynamic Torque Compensation will turn it back into position. Balanced. We use airfoil-shaped profiles on the cage. When air flows around them, these profiles act just like blades on the windmill. When torque turns the paramotor to the right, the Dynamic Torque Compensation will turn it back into position. Balanced. Why do we call it Dynamic? Other paramotors use static torque compensation. 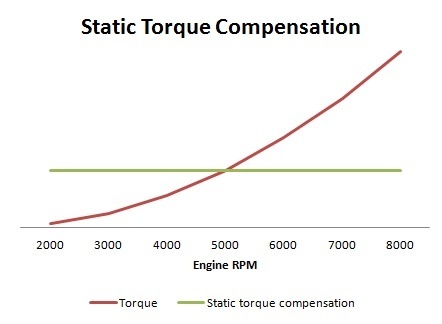 Static torque compensation means, that the compensating force or momentum is the same regardless of the torque. Carabiner offset or diagonal straps have the constant effect on torque compensation. When more/full power is applied, torque increases but compensation stays the same. The glider will turn without pilot input. The paraglider will turn to one side just as long as full power is used. The paraglider will only return to straight flight when the throttle comes down to level flight. At a low RPM the the static compensation may be too much, At high RPM it won´t be enough. As more power is applied, torque increases dramatically. The propeller creates stronger airflow and torque compensation increases. 2. More power => more prop-generated airflow => more compensation. Release the trimmers, push the speedbar to fly fast. You will have to add power to maintain level flight. Torque increases by a square function of propeller speed. That means going from 5000 RPM to 6500 RPM will cause almost twice as much torque. With the SCOUT torque will not be an issue. The prop generates enough airflow to compensate such dramatic torque increase. The SCOUT loves tight turns. You´re going to love them too! In fact most SCOUT pilots hardly ever fly straight. In fact torque is your biggest enemy on a non-straight flight except in tight turns. Torque helps to make tight turns to one side and makes it more difficult to turn to the opposite. See Javi Malaguita, our team pilot, touching the ground with the tip on the anti-torque side. torque will turn you. Sit straight, do not touch the brakes. Now add full power and count, how many seconds it takes until the glider turns 90 degrees. Does the torque compensation create a lot of drag? No, not much. It creates some drag but it is still a lot less than tubes on standard paramotors. A tube is a terrible profile in aerodynamic terms so the SCOUT still has less drag than tube paramotors. It is drag well spent. On the other hand, pulling a little on the brake all the time to compensate torque steer causes drag as well. What happens when I suddenly release the throttle at full speed? Will it start to turn to the anti-torque side? You will start loosing altitude:-). Now seriously, no big change. If you release the throttle, torque is immediately gone. As the main source of airflow for the Dynamic Torque Compensation comes from the prop, the airflow decreases in the very same moment. Your flight will remain straight. Speed of flight affects the Dynamic Torque Compensation but its effect is minor. Does the torque compensation work on the ground during takeoff - with no/low airspeed?. Yes, but in a less than optimal way. Most of the airflow for the Dynamic Torque Compensation is generated by the propeller. Although speed of flight helps, it´s not the main source. Propellers are optimized for best performance in flight. This means that with zero speed of flight they are less efficient and have higher torque on ground than in flight. During take off there will be some torque left uncompensated (we are sure a lot less than with other paramotors). Best practice is to add power gradually and continuously. What happens when I turn off the engine for landing. Will the SCOUT be overcompensated and start to turn? Yet again, no, nothing to worry about. As the main source of airflow for the Dynamic Torque Compensation comes from the prop, the airflow decreases in the very same moment. Your flight will remain straight. Speed of flight is not enough to have a significant effect. All the SCOUT pilots land no problem! Do we need higher angle to have more compensation? Torque Compensation increases due to increased airflow. There is no need to adjust the angle. It would be totally unnecessary. It works fine as it is. Would counter-rotating propellers be better? We are a big fan of every innovation to our sport. We have not tested that system as we are very happy with ours. Counter-rotating props seem to be very complicated and heavy. Definitely more expensive than our solution. The rear prop would have to be way too far back and may get the lines tangled. Gyroscopic effect may be higher too, as the rotational mass is doubled. Is it possible to install any engine? For the full Carbon cage it is only possible to use engines with counter-clockwise turning prop (with belt reductor) such as Vittorazi Moster, Corsair, Cisco, Simonini, Polini Thor 190 among others. This is basically because the angle of the SCOUT carbon spars is given by production. In future we will have a full carbon version for clockwise engines too, but not at the moment. The Enduro cage is universal and with very little effort it is possible to switch to the other side. Any engine is compatible with the Enduro cage.